Full name of the production activities – manufacture of polypropylene products. 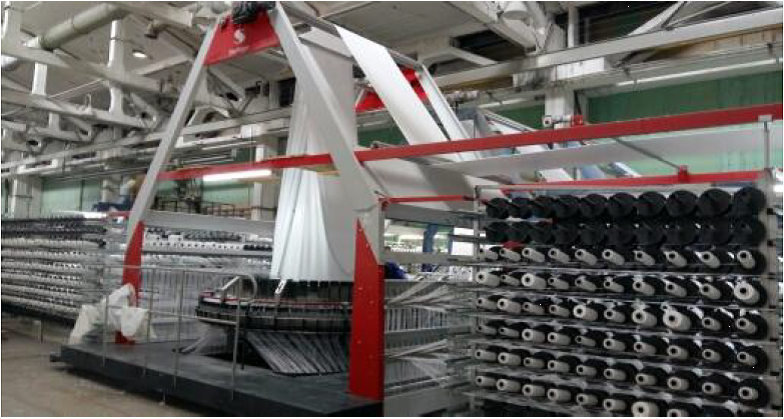 Method of production – polypropylene tapes extrusion through the flat slit die followed by weaving of products. The office building is made up of 4 floors of the total floor area of 9,216 square meters. The production building includes 4 passages of 168 m х 96 m.
The total floor area of the production space is 16,128 square meters. GRADE “C” – technical type, for construction materials (asbestos, cement, gypsum, kaolin, etc.) and chemical products (chemical fertilizers, industrial explosives). Raw materials acceptance control is carried out according to the GOST 24297-87 standard. For the production of tape, which polypropylene hoses and woven package are further made of, the polypropylene with the melt flow rate MFR 3.0-4.0 g/10 min. is used of the grades as follows: 21030 (GOST 26996-86); А4-71Е; (TU U 54008400.01-97). For the lamination of polypropylene hoses the polypropylene of А10-79У (TU U 54008400.01-97), 21230 (GOST 26996-86) grades is used. The grades mentioned above allow the contact with food products. The application of polypropylene of other grades is allowed provided that their characteristics meet the abovementioned ones. 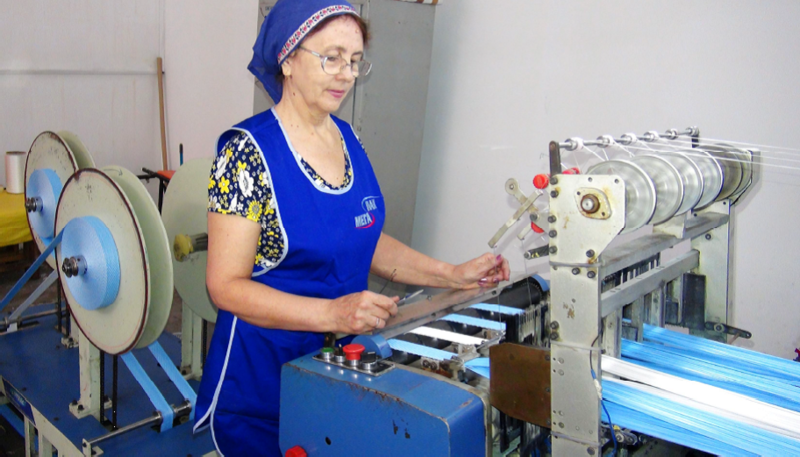 The workshop is equipped with the line of production of package made of woven materials. Raw materials are delivered to the workshop from the warehouse. Polypropylene tapes are produced on the extrusion machine according to the process flow diagrams attached, type JP 75 R 150, LOREX 1400. 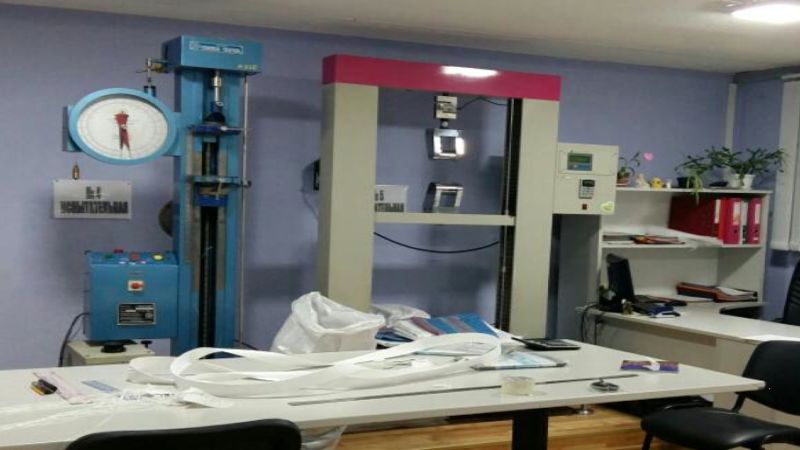 Extrusion machine for multifilament tapes production. The equipment ensures the production of multifilament tapes, used for sewing the bags, big bags, liner bags and wagon liner bags. 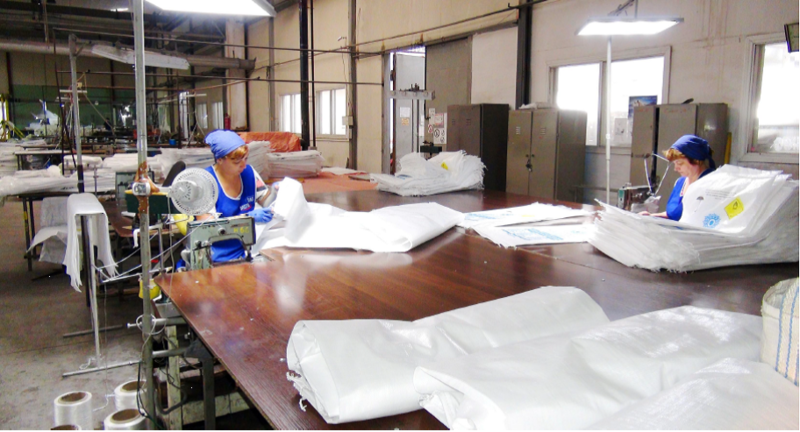 wide and the fabric with ultrasonic cutting, which is used for the manufacture of soft containers of the big bag type. Laminating machine, type GP75CK1600. Lamination line is designed for the application of polypropylene film on the woven hose or fabric, produced on the circular weaving loom. Thickness of the lamination coating is 18-45 μm. The sewing site includes: cutting and sewing of the hose according to the predetermined parameters. The sewing site is equipped with an automatic line for cutting and sewing of bags made of the polypropylene hose, type CS-30,CS-30/EM,CS-30/SERVO. Such functions as thermal cutting, button folding and sewing, automatic collection of finished bags make the process of bags production easier. 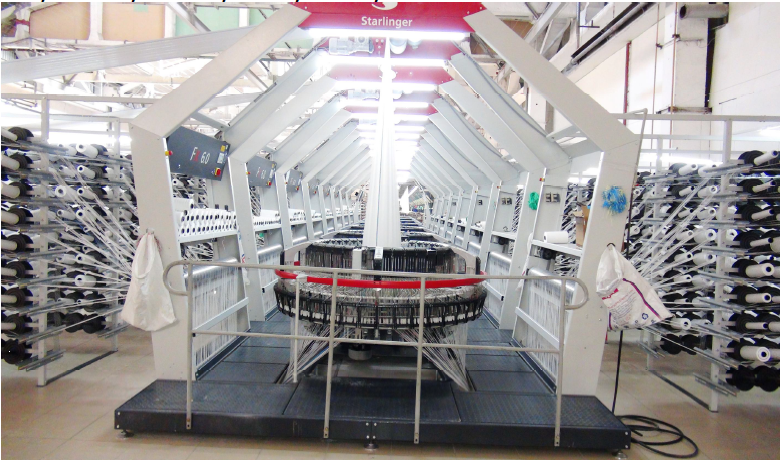 The machine is equipped with a device for automatic opening of the bag inlet. The flexographic printing machine is designed for one-two-three colour printing on finished polypropylene bags. Depending on the area of application soft polypropylene containers are produced both laminated and non-laminated: single-sling, two-sling, four-sling, with a polyethylene liner inserted (blown-in) in the process of production, with open top, with an apron, a valve, with a packaging cord, with the sewn in internal laminating fabric, with loading and unloading devices. Equipment for the production of slings, straps and the dust-guard. Additional details in big bags production are the strap, sling and the dust-guard, depending on the area of application of the big bag (that is, depending on the type of the product to be loaded). This type of products is manufactured on the needle loom. • Rewinding machine for hydro- and vapour-proof film production. Hydro- and vapour-proof film is designed for prevention of the hot air convection transfer to the insulation, as well as of the aqueous vapour diffusion to the insulation. Hydro-proof film is designed for the insulation protection from moisture, which is formed in the roof void as condensed water, or from possible roofing leakage. Are recycled to the white and black granules on the recycling site. There is a certified laboratory within the company facilities. All incoming raw materials, as well as all semi-processed materials and finished products are subject to quality control in the company laboratory. All the company products have certificates of compliance: as per GOSTs, TU, as well as safety and health certificates.